25 Kg, 50 Kg or as per customer requirements. Full Fat soya Flour Enzyme active has emulsifying and stabilizing properties. It is free from bitter substance and has pleasant odour. 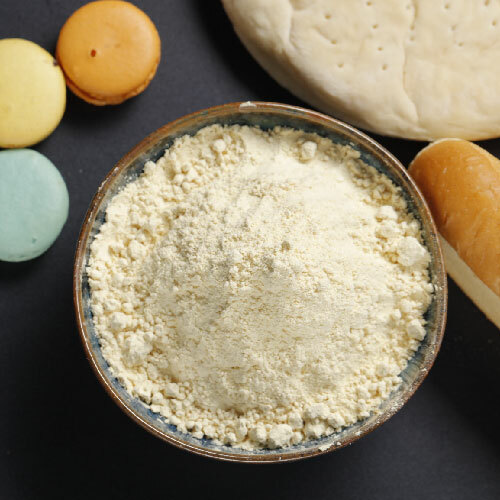 As a food supplement, it is also used in bakery industry as dough conditioner and as bread improver. It increases the loaf volume, retards staling. Can be stored for a period of 6 Months from the date of manufacture. Store away from direct sunlight and in a cool, dry place. Full-Fat Soya Flour is manufactured is from Non-GMO soybean seeds. Before processing, seeds go though a multiple stage cleaning for removal of foreign materials. The graded seeds are then cracked, de-hulled, conditioned and pulverized in hygienic & controlled condition to desired particle size.